Moulton Hall under construction, Chapman College, Orange, California, ca. 1975. Designed by Leason Pomeroy III & Associates of Orange, using a tilt-up concrete construction method. Completed in 1975, this 44,592 sq.ft. building is named in memory of an artist and patroness of the arts, Nellie Gail Moulton. Within this structure are the departments of Art, Communications, and Theatre/Dance as well as the Guggenheim Gallery and Waltmar Theatre. 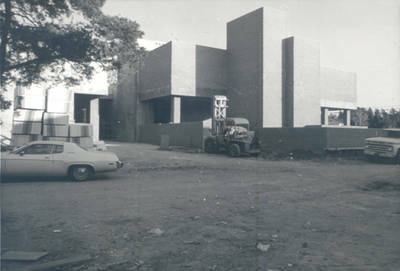 Waltmar Theatre was a gift from the late Walter and Margaret Schmid. The Guggenheim Gallery is used for the art exhibits presented by the art department and other departments on campus. BW photograph; 4.5" x 6.625"